The best jobsite table saws can make your next job or woodworking project run smoothly! We reviewed a bunch of table saws that are perfect for the jobsite, home improvement projects, or upgrading your woodworking workshop and found 10 of our favorites to share with you here. Before we get into the reviews, let’s take a look at a few key features you should be familiar with when shopping for a new table saw to take to your next jobsite. Saw Size: The size of the saw blade is typically around 10”, but can vary depending on the size of the machine. Some of the saws we reviewed come with extra blades, or you can swap in specialty blades for specific jobs. Rip Capacity: The rip capacity is the table width to the right of the saw blade. A larger rip capacity means you can cut wider pieces of wood without extra supports. Smaller rip capacity is great for smaller jobs or small spaces. Stand: While table saws are meant to sit on a table, workbench, or the ground, that’s not always ideal on the jobsite. Many saws we reviewed come with a stand, so you can use your table saw without a table available! On Wheels: In addition to a stand for your saw, some come with wheels for extra convenience! Wheels allow you to move your heavy table saw around the jobsite, or take it back to your truck at the end of the day. Size: If you have limited space in your garage, work shed, or pickup truck, make sure to get a portable table saw that fits your space! Many of them can easily slide under your workbench or hang vertically to save space. Warranty: As always, whenever you invest in job tools or equipment, check out the company’s warranty policy. That way, if something bad happens to your new portable table saw, the company will stand by their product and fix or replace it! Now that you have a good idea of what features you need in a jobsite table saw, let’s get into the reviews! We found 10 versatile, heavy-duty, convenient table saw that you could take to and from the jobsite, or leave in your workshop for everyday projects. If you don’t have time to read about all 10, that’s fine! Start with the Top Pick and Budget Pick, and then come back later to read about the rest! Let’s get started! 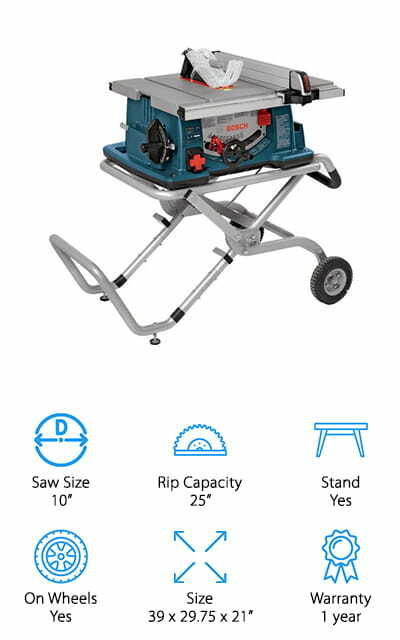 First up is our pick for the best portable jobsite table saw you could take with you wherever you need it! This Bosch jobsite table saw has a 10-inch blade with Smart Guard system that helps you cut wood accurately. 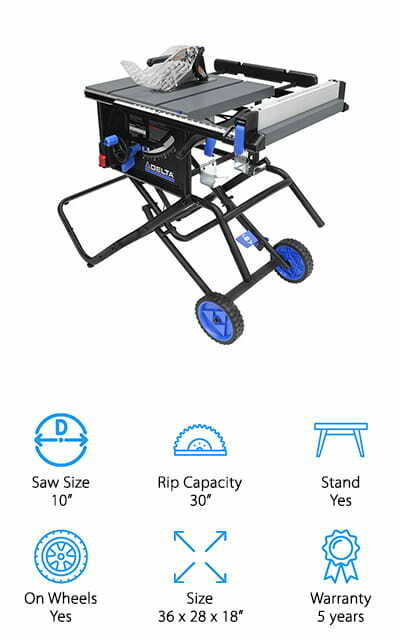 The 25-inch rip capacity is great for the job site, allowing you to cut large panels, long molding strips, or small projects on the same table! We also like that this table saw comes with a stand that’s easy to lift and lower, thanks to the gravity-rise design. It collapses easily and can be pulled by the stand’s wheels to throw in the back of your truck at the end of the day. Or you could easily tuck it into a corner of your garage or workshop to give you more space for other projects when you need it. This is a great machine to take to your next jobsite, or set it up in your garage for home projects! 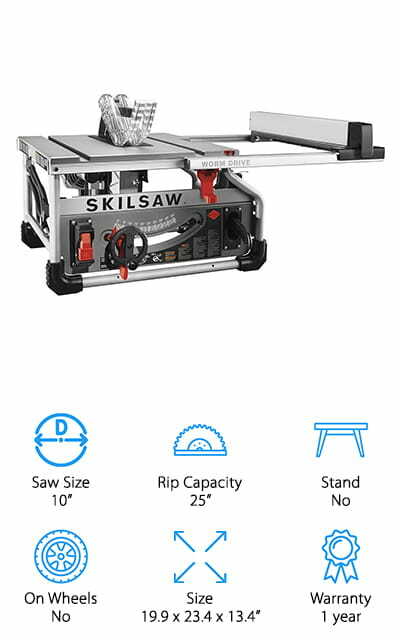 If you’re looking for the best cheap jobsite table saws, this one from SKILSAW can handle the job without wrecking your budget! It has a 10-inch blade and a 25-inch rip capacity, which is great for tackling projects on the jobsite or around the house. The dual-field motor allows for a faster blade speed and longer run-time without overheating, making this great for long shifts on the jobsite! The rip fence is self-aligning, so you can make accurate cuts more easily. There is also a vent for sawdust removal that you can hook to a catch bag or vacuum for easy cleanup. We also like that this table saw is easy to set up and move around the jobsite. It only weighs 49 pounds, so you can easily bring it with you and take it home at the end of the day. If you want a stand, you can easily purchase one from SKILSAW for some added support and versatility! We wanted to include this DEWALT jobsite table saw review because this saw is great for tackling projects large and small, and makes a great addition to any jobsite! This saw has a 32.5-inch rip capacity, so you can cut large panels, cupboards, trim, and more! The rip fence is easy to adjust for accurate cuts and can be flipped over to make smaller cuts or trim thinner pieces with ease. The 10-inch carbide blade is heavy-duty enough to handle different materials, from hardwoods to composites! We also like that this table saw has a 2.5-inch dust collection port, so you can hook it up to a vacuum or collection bag for easy cleanup. This is a major time saver, especially after a long day on the job! The folding stand is easy to set up, fold down, and wheel to wherever you need it! 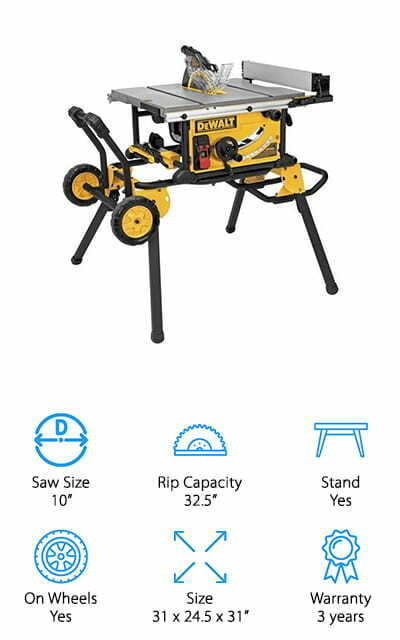 This DEWALT jobsite table saw is perfect for the jobsite, home garage, or woodworking workshop! 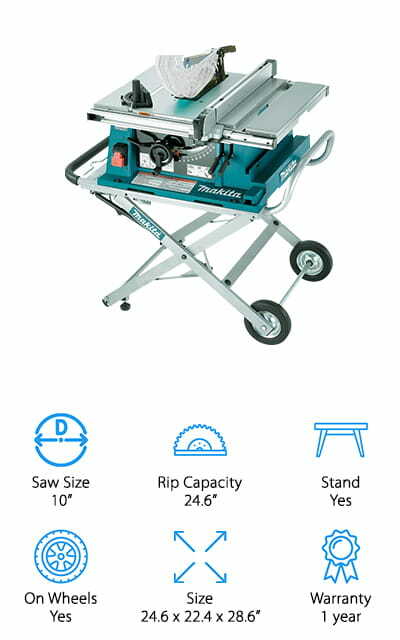 This Makita jobsite table saw makes our list because it has everything you need to get started on big projects on the jobsite or around the house! 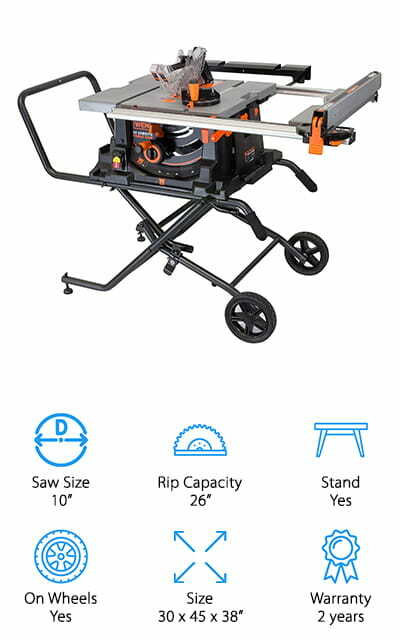 It includes a carbide-tipped, 10-inch blade that can handle cuts up to 3 5/8 inches thick, rip fence, miter gauge, stand with wheels, and all the wrenches you need to operate your saw! We like that this has a 24.6-inch rip capacity for large projects, and it has an extender on the right side to hold up even larger pieces of wood, paneling, and molding. It comes with a removable stand, so you can choose to use this without the stand on a tabletop, or attach the stand and wheel it around the jobsite! This is great because you don’t need two different saws for the workshop and jobsite. We think this is a versatile and hard-working tool that can take you from home projects to the jobsite without sacrificing accuracy or quality! 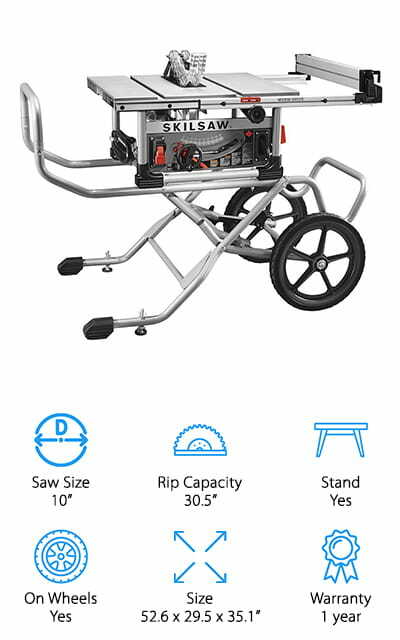 If you need a portable jobsite table saw you can bring with you to even the most challenging job sites, this table saw from SKILSAW can move from jobsite to jobsite with ease! You don’t have to worry about getting this in or out of the truck or wheeling this table saw over rough terrain. The durable 16-inch wheels can handle uneven terrain like dirt, gravel, and stairs without tipping over! The powerful 1800-watt motor and 10-inch blade cut through wood and other building materials with ease, and the pinion systems allow you to set your blades and guards for truly accurate cuts each time. The 30.5-inch rip capacity gives you the space to cut large pieces of wood, paneling, and more without sacrificing safety or accuracy. We also like that this saw comes with a sawdust port you can hook to a vacuum for easy cleanup on the jobsite! This is a great investment to add to your work kit! For a portable table saw that works just as well at the jobsite as it does in your woodworking shed, this model from Craftsman can handle a variety of projects. It comes with everything you need to get started, including a miter gauge, guards, push stick, riving knife, and wrenches needed to adjust the machine. The 10-inch blade cuts through materials with ease, and the 25-inch rip capacity allows you to handle big projects like flooring, cabinets, and drywall. We like that this table saw is easy to use on both a table or on its own stand, and you can easily switch from one to the other, depending on the project you’re working on. It also only weighs 50 pounds, so it’s easy to move around or stow away when not in use. Oh, and it’s an inexpensive table saw, so you can purchase one for work on a jobsite, and keep another one at home for personal projects! Next up in our jobsite table saw buying guide, we have this professional-grade portable table saw from WEN that can handle truly giant tasks! The saw has a 26-inch rip capacity, and to give you even more room to work, it has table extenders in both directions to keep massive pieces of wood, paneling, and more stable during cutting. It comes with a miter gauge, push stick, and adjustment wrenches that store easily on the table saw for easy access while on the jobsite. No worries about losing your tools! It also comes with a 2.5-inch sawdust port that you can hook up to a vacuum, making cleanup at the end of your shift a breeze. The collapsible stand has wheels, making it easy to move around the jobsite, and then toss into the back of your pickup truck at the end of the day! This table saw is perfect for tacking small and huge projects alike around the jobsite! Safety is the number one concern of any jobsite, and this portable table saw from SawStop has you and your coworkers’ safety in mind! This table saw uses innovative SawStop technology that recognizes when human skin makes contact with the blade, stopping and lowering the blade immediately to prevent further injury. After a 90-second wait, just replace the brake cartridge, check the blade for damage or cleaning, and start cutting again! In addition to preventing injuries, this is a high-quality table saw that can handle any jobsite project you need done fast! The 10-inch blade cuts through wood with ease, and the 25-inch rip capacity means you can do big and small jobs quickly. It also has a storage drawer to keep all your saw accessories and small tools nearby and easy to access. 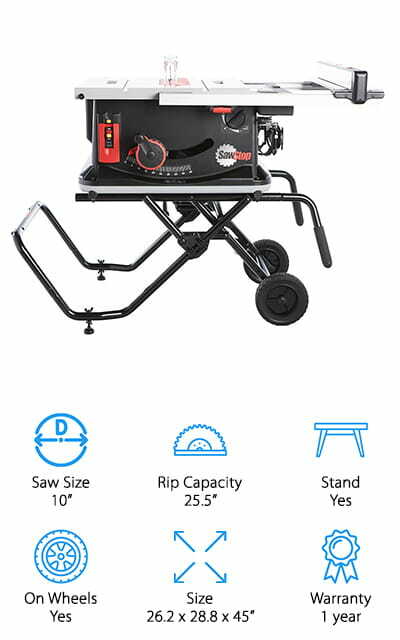 The saw comes with a sturdy stand on wheels that easily moves from room to room, then into your truck at the end of the day! This Hitachi jobsite table saw made our list because it is durable, versatile, and made to last through years on a jobsite or workshop! We like that this table saw can handle large projects, thanks to a 35-inch rip capacity to the right and a 22-inch table extension on the left of the saw blade. For added safety, it has an easy shut-off switch that allows you to cut off power in the event of an injury, jobsite emergency, or the machine overheats. There is also storage space in the machine, so you can keep your push stick, miter gauge, and extra tools with you for convenient and quick access. No more running back and forth for your tools! 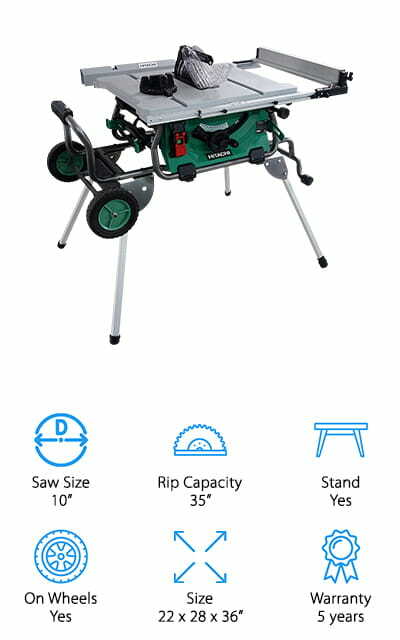 It comes with a sturdy stand on wheels to give you the ability to move your saw wherever you need it, both indoors and outdoors. It comes with a 5-year warranty, so you can feel confident that it’s meant to last! Last up in our jobsite table saw review is this convenient and inexpensive saw from Delta. 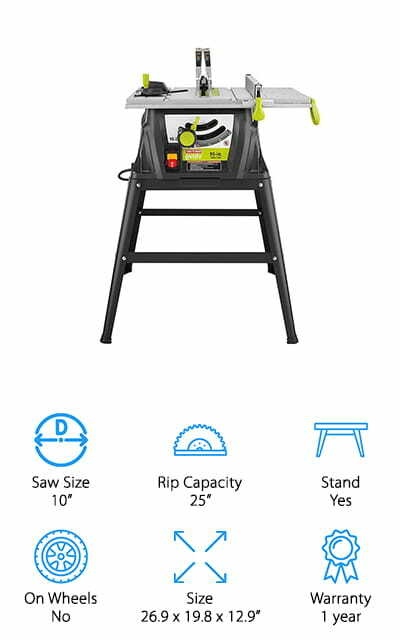 This portable table saw has a 30-inch rip capacity, which makes doing large rip cuts easy and fast, saving you precious time on the jobsite. It’s also easy to keep your table saw clean and well organized all day long. The saw blade lowers fully into the machine, making it safe and easy to clean the table surface if it gets dirty. This is great, especially if you’re working with sticky, sap-heavy woods or if you get caught out in the rain. It has plenty of storage capacity for all your tools and guards, and there is even a designated place for the rip fence to sit during storage. The stand has wheels for easy moving and collapses quickly for easy storage. This table saw comes with a 5-year warranty, which is a good sign that Delta stands by the quality of their equipment!